Investors have been rushing out of bonds ever since Ben Bernanke first hinted in May that the Fed may taper. Forget about the bond bloodbath in 1994. This is shaping up to be the worst year in history for bond funds. Investors have pulled out $72 billion from bond mutual funds this year through the first week of December, according to data from TrimTabs. Rising interest rates have also been the catalyst for the rush out of bonds this year. "The 'taper talk' that started in May proved to be a huge inflection point for the credit markets," said CEO of TrimTabs David Santschi, referring to Federal Reserve chief Ben Bernanke's hints that the central bank could begin to scale back, or taper, its $85 billion a month in bond purchases. Related: Tapering or tap dancing? The Fed began the first of three massive bond buying programs at the end of 2008 in the aftermath of the financial crisis. The goal of this quantitative easing was to keep long-term interest rates low, and in turn, stimulate the economy and the stock market. But ever since Bernanke mentioned the possibility of tapering, bond investors have been spooked. The 10-year Treasury yield rose from 1.6% May to almost 3% by September, when economists and investors initially expected the Fed to take action. In fact, investors had continued to plow money into bonds up until May. 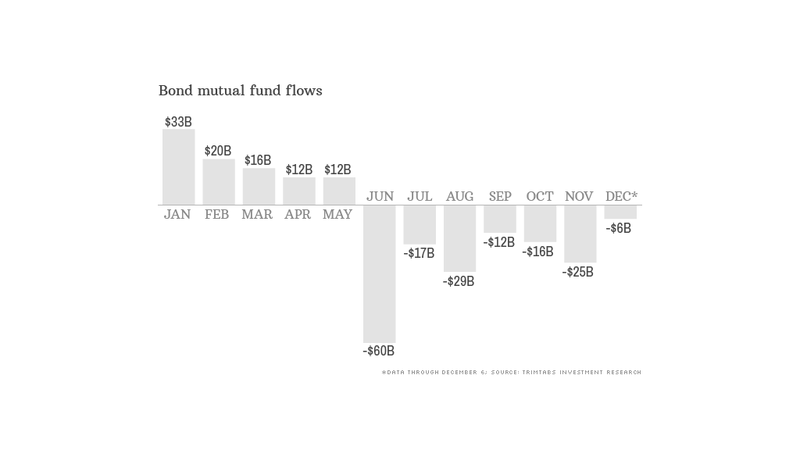 The outflows have all occurred in the final seven months of the year. When the Fed chose not to taper, the 10-year Treasury yield fell back to around 2.5% by October. But rates have crept higher again as taper talk has resumed. 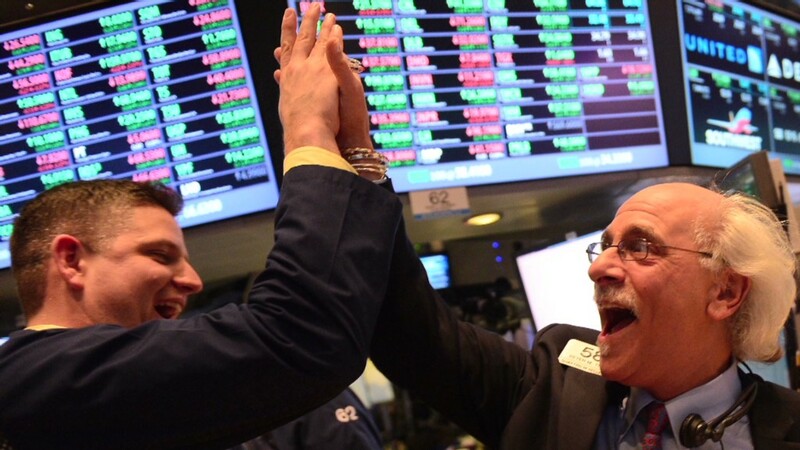 The 10-year currently is yielding around 2.88%. "The reaction to the prospect of 'tapering' among retail investors has been pretty violent even though the Fed hasn't made any changes to its bond buying program," said Santschi. "What will happen when the Fed actually takes action?" Related: Improving economy: Is it for real? Citing the recent strength in the economy, particularly the job market, some experts think there's a chance the Fed could announce plans to begin tapering at its next policy meeting on December 18. But most anticipate the central bank will wait to pull the trigger until early next year, after Bernanke's term is up and Janet Yellen assumes the role as Fed chair. Bond investors aren't the only ones getting hurt by the tapering fears. Big investment firms with a focus on the bond market have suffered too -- especially Pimco and its "bond king" Bill Gross. His Pimco Total Return fund (PTTRX), which is down 1.6% in value this year (see correction below), has lost nearly $37 billion of its assets this year. That's the most among bond funds according to Morningstar. The second biggest loser, Vanguard Inflation-Protected Securities fund (VIPSX), has lost almost $14 billion in assets. Earlier this year, Pimco Total Return lost its title as biggest mutual fund in the world to the Vanguard Total Stock Market Index Fund (VITSX), which now boasts nearly $300 billion in assets. But Gross isn't the only bond guru having a tough time. Rival bond fund manager Jeffrey Gundlach's DoubleLine Total Return Bond Fund (DBLTX) has lost nearly $4 billion this year. But while bond mutual funds have been bleeding assets, bond exchange traded funds have managed to pull in $6 billion. Still, that's the weakest level of inflows since 2007, when ETFs, and bond ETFs in particular, were still in their infancy. Correction: An earlier version incorrectly stated the change in Pimco Total Return's Net Asset Value as its year-to-date return.